This Vision of HRtraining is to be, and to be recognised as, one of the most respected and professionally managed private training organisations in Australasia. HR training is committed to providing quality Vocational Education and Training regardless of gender, sexual orientation, academic standard, race, religion, disability or special need. We will assist and promote the process of knowledge and skills transfer to all learners, and benchmark against industry Best Practice. We will remain innovative and be a pioneer of change in an environment of continuous improvement, which values honesty, integrity and strives for the mutual benefit of all. HR training will achieve our vision by ensuring experienced, qualified and motivated Trainers maintain established high training standards and exceed client and learner expectations as we improve the KNOWLEDGE, SKILLS and ATTITUDE of the greatest resource an organisation has – its people; through human resource management and professional courses conducted within a creative and friendly learning environment. HRtraining was established in 1991 in NSW, Australia. In 1996, the company was granted approval in Australia to be a Registered Training Organisation (RTO); able to deliver training for the issue nationally accredited certificates. In 2004 we began moving into the Asia-Pacific region to consult and deliver our professional HR services and accredited certificate training courses. In 2007, we further expanded operations to other countries. By the end of 2008 we had trained in over 40 countries in the areas of Security and Risk Management, Effective Communication and Occupational Health & Safety. In 2011 ONLINE training and assessment through HRtrainingcollege.com allowed us to train anywhere in the world. But face-to-face delivery is still, we believe, the most effective training method and by 2013 we had delivered face-to-face training in 53 countries. In 2014 we launched eLearning video courses in Work, Health, Safety and HR to help organisations cover compliance to employees that are at a distance or in numerous locations. Our approach to training and HR development is to help organisations integrate their current workplace training with our accredited online and face-to-face certificate courses. Our courses are ‘hands-on’, including practical training and demonstration that will increase knowledge and skills to bring about real change in the confidence and skill ability of managers and staff. A training process where we analyse an organisation’s needs so we can design courses specific to the organisation’s requirements. Training is about gaining knowledge, transfer of skills and the ability through competence to IMPLEMENT new knowledge and skills into a workplace or region. Many training courses in the worldwide market place assume participants are able to transfer learning and new skills from the course to their workplace or job – but this is not the case ! A person firstly needs to be motivated to do so and that is why HR training do not just train for the transfer of skills and knowledge. ALL our courses include content designed to bring about a change in participants’ motivation and attitude to help participants realise the changes they need to make in their own workplace and HOW to implement these changes. Training is about people – about changing their behaviour, enhancing existing skills and helping them gain knowledge to achieve their goals. We all acquire a body of knowledge, but the key to our effectiveness is developing and improving our skills over time. We therefore need to acquire, maintain and update our skills throughout our life. This is called life-long education. HR training is proud to be a part of the growth of individuals through Vocational Education and Training. 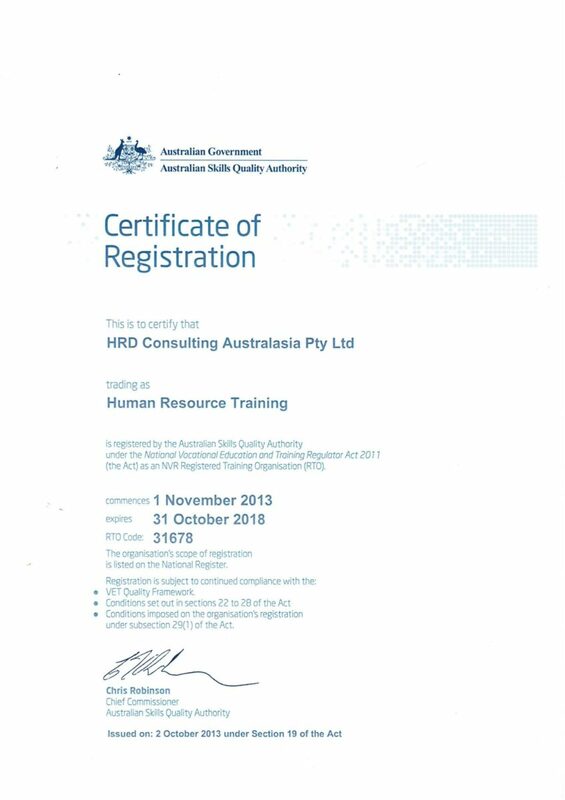 HR training provide accredited certificate courses which are recognised throughout Australasia and the world under the Australian Qualifications Framework. But we also offer Professional Short courses for specific skills via half day workshops. Courses are completed with flexible delivery to fit into your available time and schedule. The AQF is the national policy for regulated qualifications in the Australian education and training system. It was first introduced in 1995 to underpin the national system of qualifications in Australia encompassing education in schools, vocational education & training (VET) and higher education. AQF qualifications are recognised not only in Australia but internationally because the register of high schools, training providers, colleges and universities combined with the register of accredited certificate training courses provide assurance that the providers and courses are regularly audited and approved by the Australian Government. AQF qualifications link with each other in a range of learning pathways between high schools, Vocational Education Training colleges and Higher Education universities. The AQF provides for flexible, transparent and systematic learning pathways.